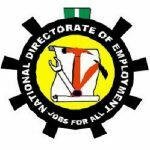 As part of its sustainable empowerment drive in the country, the National Directorate of Employment, NDE has announced plans to train a total of 2000 youths in Rivers State on various skills. According to the NDE, the scheme is tagged, ‘Basic National Apprenticeship Scheme’ and beneficiaries are to be trained in electrical installations, catering, fashion d, signing, welding and fabrication. Spokesperson of NDE in the state, Mr. Dumka Legenne, said already the scheme has commenced as beneficiaries have been posted to various accredited training centres and will last for three months. Legenne explained that the new scheme has 600 males and 1,400 females as participants and training will commence in March. Consequently, he added that the agency’s Special Public Works Department has floated an empowerment scheme on solar power repairs and management. According to him, “These days, there is a shift to alternative power and energy and NDE wants to tap into that area to provide skills. “We have attended up to 95percent of beneficiaries stipends, except those who abscond from training or gave variance account numbers. “After the training, the beneficiaries are to get a loan worth about N5million, which they are expected to pay back within a specified period. He stated that only those who have participated in previous NDE training and registered business names will benefit from CBN/NDE loan scheme. “The programme is to provide a loan in diverse business areas with an emphasis on agriculture,” NDE said.